This the first tool for Windows 8 posted on TheCustomizeWindows. 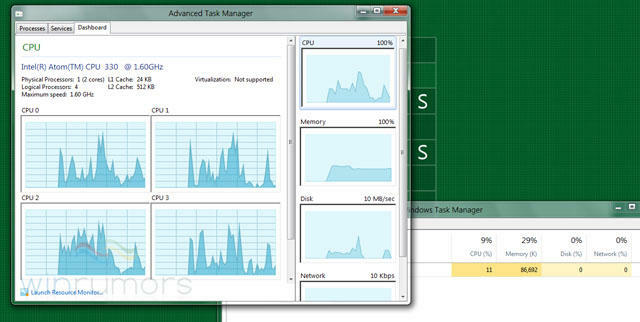 Simply use the provided batch file to have the Windows 8 M3 like Windows Task Manager in M1. Developed by andreascy. It is tested on Windows 8 7850 build by the developer. It is nice to have first free Tool. This Article Has Been Shared 2011 Times! Windows 8 M3 Pdf Reader for Windows 8 M1 trick will enable to use M3 Pdf Reader in Windows 8 M1. Windows 8 M3 Webcam Capture application in Windows 8 M1 trick will enable you to use Windows 8 M3 Webcam application in Windows 8 M1. Windows 8 M3 Build 7989 Animated Explorerframe V.3 is here to Customize Windows 8. It is the upgraded version by the developer, free to download. A blocking tool is available for organizations that would like to temporarily prevent installation of Service Pack updates through Windows Update. This tool allows you to completely transform your Windows 7 to Windows 8 M3 Build 7959 including System properties logo, taskbar user profile icon, about Windows window, logon screen and many more. Cite this article as: Abhishek Ghosh, "Windows 8 M3 Windows Task Manager for Windows 8 M1," in The Customize Windows, June 4, 2011, April 18, 2019, https://thecustomizewindows.com/2011/06/windows-8-m3-windows-task-manager-for-windows-8-m1/.